End of the Day Closing Circle Reflection Cards - UPDATED 1/15/17!! UPDATED 1/15/17: This product now includes 44 questions instead of 28. I have also added cut lines based on a buyer's suggestion!! You can simply re-download if you already own this product! At the end of the day I gather my students in a circle on the carpet for our closing circle. A closing circle is a great way for students and teachers to reflect on the day, build community, and practice listening and speaking skills. Closing circles help build a positive classroom environment where students feel free to share what’s on their hearts and minds. 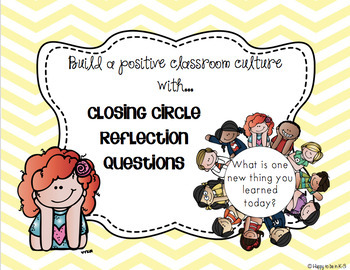 This product contains 44 closing circle questions to promote reflection, sharing, and discussion. These questions can be used for all grade levels! Four blank cards are included so you can write your own questions. 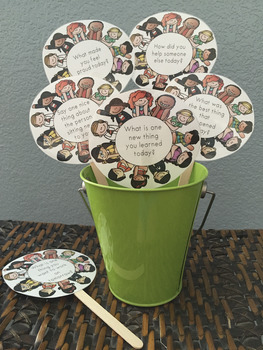 This product aligns with the Common Core Speaking and Listening Standard for multiple grade levels, as well as the Responsive Classroom model. 1. 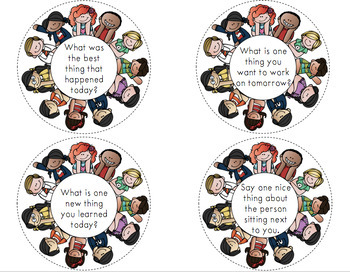 Have a student draw one card and allow each student in the circle to share their answer. 2. Have each student draw a different card and share their answer with the group. NOW AVAILABLE - Opening Circle Reflection Cards!